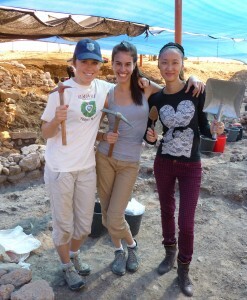 From left, Kelsey Heflin, Kayla Nonn ’15, and Qian Zhang (RDS ’13) joined CMC's Gary Gilbert, along with faculty and students from other Claremont Colleges, Penn State University, Trinity College, and the University of Massachusetts, Amherst, in the excavation of Tel Akko, located long the Mediterranean coast in northern Israel. The locals know it as Napoleon’s Hill, and it has served as a “major emporium” for the ancient world. For three lucky CMCers and a professor, Tel Akko was also an amazing place to spend a month this summer, digging in the dirt for remains of Canaanite, “Sea Peoples,” Phoenician, Persian, Greek, and Hellenistic cultures. In recent weeks, associate professor of religious studies Gary Gilbert led a group of CMC students in a month-long, intensive archaeology field school in Israel. Kelsey Heflin ’16, Kayla Nonn ’15, and Qian Zhang (RDS ’13) joined faculty and students from other Claremont Colleges, as well as Penn State University, Trinity College, and the University of Massachusetts, Amherst, in the excavation of Tel Akko, located long the Mediterranean coast in northern Israel. From the Early Bronze Age to the Hellenistic period (3000-100 BCE), the site of Tel Akko was one the most important maritime cities in the Eastern Mediterranean. The site is located a short distance from the Old City of Akko, also known as Acre, a UNESCO World Heritage site possessing some of the best-preserved Crusader and Ottoman architecture anywhere in the world. Today the modern city of Akko enjoys a rich mixture of Jewish and Arab cultures that reflects the diverse population of the city. During four-weeks in Akko (June 30 through July 27), students became integral members of the archaeological team excavating the site. Their work included fieldwork at the site, analysis of the material culture of ancient Akko, study of the theory and methods of conservation and heritage preservation, and lectures on the city’s history from antiquity to the present. In the field, students learned about and practiced fundamental archaeological methods and techniques, and received instruction in the analysis of the material remains, especially pottery. They also studied the theory and practice involved in the conservation of archaeological sites. The hard work of the CMC students paid off with some very impressive results. Kelsey Heflin discovered a jar handle with a Greek inscription that provides information on wine trade in the region. Kayla Nonn uncovered a beautiful ring, approximately 2,800 years old, made from shell with intricately inscribed decoration. The program also included a four-week series of lectures and tours delivered by faculty from the participating schools and staff members of the Israel Antiquities Authority. The lectures covered a diverse array of topics including history of ancient Akko, the Crusader city of Acre (the Medieval Christian name of the city), the rise to prominence of the Ottoman city in the 18th century, Ahmed Al-Jazzar’s defeat of Napoleon, and the role of its prison during the British Mandate of Palestine. Though most of the time was spent in Akko, Gilbert led the group on three, one-day programs in Jerusalem, Caesarea, and the Galilee, introducing students to the history and culture of the region. Gilbert serves as an excavation square supervisor, and currently is writing a history of the Jewish community in Akko, for a volume on the city’s history, as told in archaeological record and literary sources. This was the fourth season of the Tel Akko program. Thus far, eight CMC students have participated in the archaeological field school, and Gilbert says plans are to keep those opportunities open in coming summers.